It has been almost 4 weeks since John and I moved to Arizona. Being an Arizona newbie, I am learning a lot about the state (and the Southwest) that I never knew before. So, I thought I would share some of these interesting tid-bits! When I first heard about haboobs I thought it was a joke. Have you heard of these things?! They are crazy wind/sand/dust storms. Along with the tinted windows, I can't even tell you how many cars left running I see in the parking lot. It's a pretty brilliant idea... so long as no one steals your car! Also, many businesses (some Targets and grocery stores) have carports for their parking lot and misters spraying cool water while you walk into the store - not a bad gig! When John and I first moved here, the cashiers at grocery stores would ask us if we wanted ice when we were checking out. I thought they were asking us if we wanted to buy big bags of ice. I later realized that they were wondering if we wanted small bags of ice to put in our grocery bags to keep our food cold for the drive home. Arizona thinks daylight savings is silly (and I do too!) so they decided not to join in on the party. Half of the year Arizona is Mountain Time, and the other half of the year they are Pacific Time. Although Arizona is the desert, that doesn't necessarily mean flat! 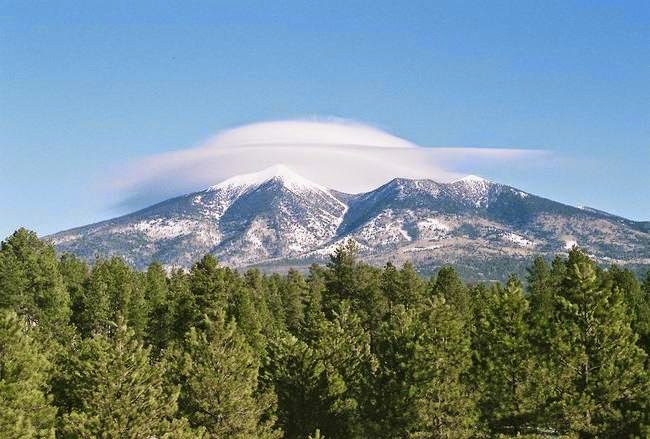 There are quite a few mountains and mountain parks around Phoenix and the state. This is a bit confusing to me since I always picture Arizona as flat desert but Flagstaff is at 7,000 feet elevation and Sedona is at 4,500 feet... and the highest peak is at over 12,000 feet! haboobs sound terrifying! I have been to Arizona once and I love the dry heat compared to the humidity - but that is so funny about the ice in bags and misters spraying water! we have a bar at home that sprays mist on you as you walk in and out which is fine, but annoying when you've all prettied up and the water ruins your hair, lol. Seriously, AZ sounds like a completely different planet. ha! It looks gorgeous though! What do ya'll do when one of the haboobs come rolling into town?! I had no idea that Arizona was in different time zones during different parts of the year! 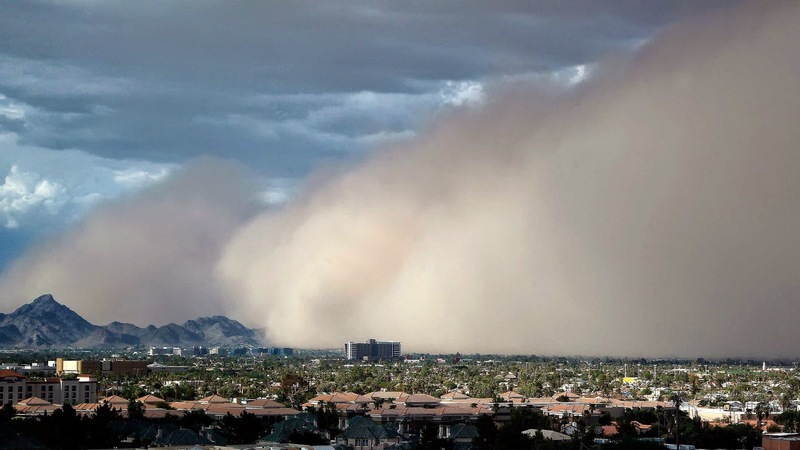 This is the first I've heard of/seen those haboobs...looks pretty scary to this city gal! Hope you're staying cool out there! It looks like such a beautiful state but that first picture with the storm is nuts!! I agree with biana! That first picture is so scary!! I have cousins that live in Phoenix and they told me about those storms. It's crazy! Wow, sounds like a different world! I cannot imagine people just leaving their cars running. I remember watching some kind of news report or special on the dust/sand storms and thinking they weren't possibly real because of how scary they look! The ice for the grocery bags is a pretty genius idea! That is pretty neat! Thank you for sharing these! I was not aware of any of them! Haboob is such a funny word! The storm doesn't look that funny though! How long do they typically last? Ice in your grocery bags, I would have had the same reaction you did! Do many people do this? The misters sounds like a pretty great idea! They need to implement some of those cooling things here in South FL! I love the idea of misters and ice at the grocery store. Haboobs (funny name) seem crazy! in LOVE with this post. haboob?? what in the heck! that thing looks scary! and i love my tinted windows. it's just a little tint that keeps my car cool (for the most part). i would've totally thought it was bags of ice too. hahaha! haboob looks crazy and scary! I had no idea how hot it actually was out there...the ice in the grocery bags blows my mind! That wind storm looks crazy! Ice to keep your food cold on the way home -- that's a new one. Tinted windows is a So Cal thing too, but if you go too dark in CA you'll get a ticket. I loved Sedona when I visited a few year ago. The hubby went to NAU in Flagstaff and loved it. Yuck to those storms! And too funny about the ice! My husband lived in Arizona for a couple of years growing up so I knew about the time zones but have never heard of any of the others!! I can't wait to quiz him and see if he remembers this stuff!! yup when the rest of the nation is complaining about daylight savings time and whether or not do we go ahead an hour or get an extra hour of sleep you never have to worry about any of that!! Wow, so many strange things, but that's what makes it special!! Yay! That Haboob?! Holy crap?! Have you experienced one yet?? Those haboobs are crazy, and I was not aware of the ice in the bags! That's crazy too haha. WOW! I have been to AZ a couple of times but I never knew about most of these things since I wasn't ever there for more than a week visit. How cool about the misters and the bags of ice. I love the ice for the groceries idea. That's simply brilliant! It's a whole different world over there! Those haboob things look sort of terrifying! Have you experienced one yet?! the haboob is insane... I know that they have a tough time landing planes in phoenix sometimes because of them!!!! Wind is horrible. Join us in Georgetown in a few years--no wind and we'll all be together in Texas! The ice bags made me laugh--stay cool.